I’m still swamped at work in advance of a conference this weekend, so alas, Sunday’s bike ride had to end in getting some work done. Fortunately, A. needed a delivery of some packages from campus, and she lives out in Federal Hill, so I used that errand as an excuse to stretch my legs a little. 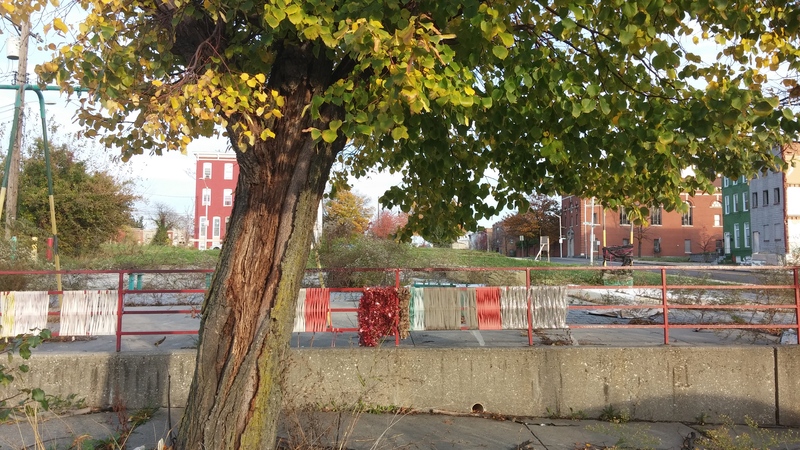 It was unseasonably warm–the other cyclist waiting at the light at 32nd and Greenmount agreed that our jackets meant we were both overdressed–and I happily let the breeze touch my bare legs as I sped over and down the hill. The Inner Harbor was all Ravens purple, so I got to use my outside voice to remind pedestrians that I was about to pass them on their right. I dodged the cars looking for parking that was long gone, took my left at Riverside Park and my right before unloading my pannier, holding a baby for a few minutes, and heading back out. I found myself at a tiny pub on a tiny corner that was mostly empty, aside from a few friends of the bartender. The place steadily filled up as we all waited for the lunch menu and cheerily negotiated which football games would be on which televisions–there are a surprising number of Bills fans in this neighborhood. I graded a whole bunch of papers, interrupted by a few chats. One was with a young woman who dropped out of high school to get herself to community college sooner. I asked her what she planned to major in. I’m saying I’m undecided, she said, so I don’t have to tell my mom I’m majoring in English and am not going to be a doctor. She just had a poem selected for publication in an anthology–she just about fainted when she got that news, apparently. Maybe that’ll calm her mom’s fears, she hopes. The bartender told us about not shaving his mustache for the month, to raise awareness for prostate cancer. His dad’s in recovery, but he just feels like he needs to do something. The guy at the end is a report card widow this weekend–his fiancee’s job wrangling 12 year olds extends to the weekend. I always feel grateful for those teachers who do so much work to make my teaching job such a comparative ease. We all drank–some more than others–cheered on whomever was scoring touchdowns, and I got through a goodly amount of student writing before it was time to head home in time to beat the drunk drivers leaving the stadium–home games require an extra layer of preemptive safety, in my experience. The streets were still fairly empty, and the ride had that rattling-around-in-an-empty-cage feel that rides take on in post-industrial cities like this one, and I liked it. I took a small detour at Chase to check out the remains of D.’s weaving that she did at this site a couple of years ago. She gathered us together to decorate the bars of this abandoned park with ribbons and lace and old hoses and found fabrics. It was such a lovely day, making something out of this space that certainly has never been nothing. Some of it is still there, and I recognized some of my handiwork. The lot’s overgrown, still, and now there’s a mattress dumped in the middle. They’re still planning a park across the street, even though there’s this park right here, and the vacants surrounding it are still vacant, the intrepid residents still residing. A quick check up and then back home, up the hill. That’ll do, I thought, but it’s getting time to check out the rest of the spots in this city I’ve been missing. Fortunately, neither Baltimore nor myself and my bike are going anywhere any time soon. This entry was posted in art, blight, personal and tagged art, Baltimore, Barclay, blight, Federal Hill, Park Bench Pub, Weaving Bee. Bookmark the permalink.